These are moist and delicious. They are versatile and can be adapted to dozens of flavor and texture variations. Mini muffins are two-bite delights. I Told you Thag. Too Much Fire Under Bread. Sheesh! Wow! I am stunned when I think about how long bread has been a staple in the human diet. It’s even mentioned in the Bible. In my twisted mind, I pictured one of the Old Testament prophets trekking to the marketplace and handing out a few sheckels for a nice white loaf so light it could float. What a miracle. What a “wonder.” NOT! Bread then was flat, dense, gritty, and hard to chew without soaking it in liquid. As humans, we love our bread. Always have. People have been making flour for at least 30,000 years. Bread making goes back at least 5,000 years, but it was nothing like what we call bread today—that baby is a modern invention. If you were sitting around the fire in Neolithic times (stone axes, spear points, and such), you would be munching on hard, grainy, dense, flat bread. Most likely it would also be burnt on the outside. Regulating the temperature on a communal fire pit wasn’t easy. 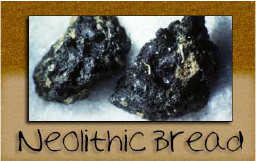 The oldest bread that we can really call bread was found in Oxfordshire, UK and dated to around 5,500 years ago. The two “loaves” look like lumps of coal. It was analyzed at the Oxford University Radiocarbon Accelerator Unit in New Zealand, then Dr. Mark Robinson from Oxford University looked at them through a microscope. Imagine his surprise. “Holy yeast farts, Batman. This was BREAD!” Maybe that’s not what he really said, but I would have. And so it went for centuries. Even though ovens date back to around 29,000 BCE, they were really built to roast mammoth, not bake bread. In pre-dynastic Egypt, home oven pits were used, but they were not made for baking bread and were cumbersome to operate. 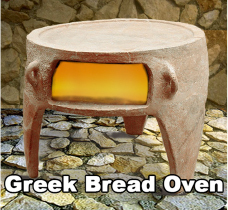 It was the clever Greeks who invented a free-standing, front-loading bread oven. It was a hit, and everyone along the trade route had to have one. It was the latest high-tech fad and a must-have for the up and coming in-the-know couple. But, even with the convenience of a portable, front-loading bread oven, the end product was pretty hard and chewy. 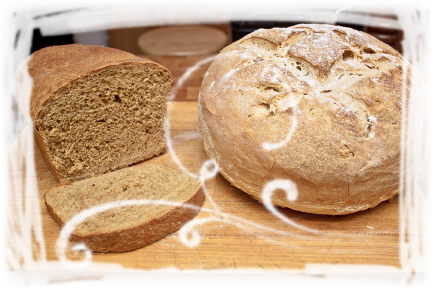 Yeast-leavened bread was still the dream of sorcerers. Any leavening that entered bread dough came from vagabond yeasts riding the wild winds. They dropped down into sticky dough and became trapped like dinosaurs in tar. The baker then spent a lifetime trying to figure out why sometimes the dough puffed up and other times it just laid there like a lazy donkey. Most likely it was the Egyptians (of course, wasn’t it always the Egyptians) who figured out about leavened bread. Maybe they ran out of water for their dough and were too lazy to trek down to the well to get more. Looking around, someone said, “Hey, use beer. They’ll never know the difference.” Voila! It rose up and the magic was born. Even with leavening, the bread would have been heavy and dense. Why? Because the flour we use today is NOTHING like ancient flours. Depending on geography, they used barley, millet, spelt, kamut, emmerkorn, or rye. These have gluten, (essential for a light, stretchy loaf) but very little. In Egypt, thanks to their obsession with preserving everything, there are hundreds of bread loaves to examine. Most looked like large pizzas without the toppings. Some were round, but still pretty flat. They, too, used a variety of grains, but a common grain was Emmer. This takes some doing when processing it into flour because its thick chaff has to be removed. To process it, the Egyptians sprinkled the grain with water, then pounded it with a wooden pestle in a limestone mortar. Then it was dried in the hot sun. Next, the grain was winnowed to let the chaff fly off into the air and the grain sink back to the ground. After that, there was sieving to remove any leftover flakes of bran, chaff, and stone from the pestle. The sieves were made of rushes and not very efficient, so, as a last step, it was picked over by hand. Finally, the grain was milled into flour using a flat grinding stone. Phew! Even with all this, some chaff, stone grit, and bran remained, so the Egyptians just got used to having stuff stuck between their teeth. There’s an ancient Egyptian bread recipe included in my book, The Dough Also Rises. It is based on one found in an ancient tomb, minus the grit and stones. So fast forward to this century. What a difference! Is there anything better, more sensual, and more addicting than the aroma of fresh bread baking? Don’t answer that. You gotta admit, though, that this is one helluva great smell. It’s so good that some bakeries install a fresh bread fragrance atomizer in their shops and pump the fragrance outside to attract customers. This fragrance speaks to our ancestral pleasure centers. It is so powerful that some real estate agents spray an artificial fresh bread aroma in the houses they are trying to sell or in model homes. My book, The Dough Also Rises–How to Make Great Bread is available in Ebook from Metastudies.com, amazon.com, and barnesandnoble.com. Do you make bread? I’d love to hear about it. I don’t often celebrate holidays. They always seem a little silly. But Thanksgiving has a deeper meaning for me. Giving thanks is a worthwhile thing to do. It is, in my never-to-be-humble opinion, something healthy and rewarding and something we do too little of. We celebrate Thanksgiving with others we invite into our lives. I would NEVER, for example invite my relatives. Those I care about are either too far away or dead. Those I don’t like, I don’t include in my life. I’m sure they are glad of it, too. After all, they don’t invite me to their things, either. SMILE. So, anyway, this year, some of my usual guests could not be here on Thanksgiving due to their family issues. So Sad, but I wish them well. We are having two beautiful souls as guests that we have not known long but have enjoyed. He is a musician who plays the Native American Flute with a magical touch, and his fiance. They are delightful people and I am overjoyed to share our Thanksgiving with them. As many of you know, I have a neurotic need to cook everything from scratch. Fortunately I have my husband, Allen, and ex-hubby/best friend, David to help. Allen is making pumpkin pies from the pumpkins we grew. He is in charge of the turkey and cleaning most of the house. David is doing the mashed potatoes, and maybe the cranberry sauce. I am roasting broccoli and brussel sprouts with chilis, garlic, and butter. I am also making a pecan pie. Plus, we will be serving the amazing chunky applesauce that David and I made after our run to the apple orchards in Oak Glen, CA. Good food, good wine, good friends. What more could anyone ask for on this special day. I hope yours is as wonderful as you want it to be. 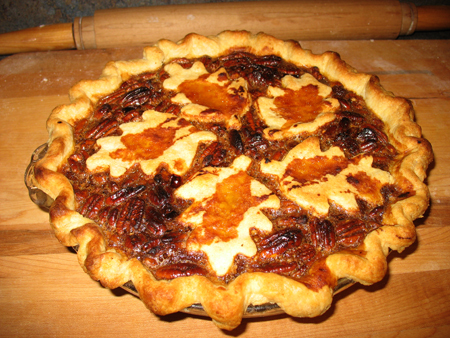 Here is the recipe for my Pecan Pie. It is out of this world great. Not just a layer of broken pecans on top. This puppy has pecans all the way down. It is sweet, but not overly so. It has a light texture with crunchy pecans and a bit of chewiness. Triple YUM. 1 cup light brown sugar, or substitute Splenda and one tablespoon Barley Malt syrup. 1. Preheat oven to 450° F. Adjust oven rack to lowest position. 2. Take 3/4 of the pie dough and roll out to fit a deep dish pie pan. Line pie pan, crimp edges. Chill. Roll out extra dough and with a cookie cutter of your choice (I used acorns), cut out shapes. Place on a plate, cover with plastic and chill. 3. Filling: In a saucepan, heat, over medium heat, maple or agave (with extract) syrup, brown sugar or Splenda/barley malt syrup, cream, and molasses or barley malt syrup. Stir until all ingredients are mixed and any sugar is dissolved, about 3 minutes. 4. remove from heat and let cool five minutes. Whisk in salt, butter, then egg yolks. Stream egg yolks while beating to avoid cooking them. Cool another 10 minutes. 5. Pour pecans into chilled pie shell. Carefully pour filling over pecans. Decorate the top of the pie with the cut outs. 6. Place pie on a cookie sheet. Put into the oven on the lowest rack. IMMEDIATELY reduce oven to 325° F.
7. Bake until pie is set and center jiggles slightly when shaken, about 45 to 60 minutes. 8. Cool pie on rack for 1 hour then in refrigerator until set, about 3 hours or overnight. Bring to room temperature before cutting. No Rubbery Reconstituted Eggs and Air Bread! Only Really Good Breakfast. At our Joshua Tree Healing Retreat this year, we added a new cook – Laura Darms. She was the Breakfast Guru. And what a masterful job she did. Our regular cooks, Lisa and Nancy also did great and wonderful things, but I want to share my favorite – Feta and Spinach Frittata. A Fritatta is like a quiche, but even better, no crust, and easier to fix. 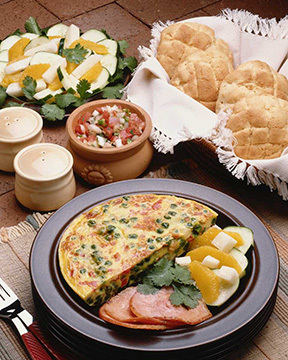 It’s an Italian word that means to fry, even though Frittatas aren’t fried. It’s kind of like an open-faced omelette, only easier to make and, I think, more delicious. Frittatas are started on the stove to cook the veggies, then the eggs are added and the whole thing is popped into the oven. When done, they are sliced up like a pizza. DELISH!!! It is light, fluffy, flavorful, and I couldn’t get enough. I could have eaten the whole pan myself. Fortunately, there were 25 other people there with spoons out to prevent me from grabbing the pan and running to my room. It’s easy to fix and can be made for a few or a giganto crowd with little trouble. Let me know how you like it. I’ll pass on the praise to Laura. In order of quantity – tomato puree (they don’t say organic, so probably GMO and pesticide loaded), water, high fructose corn syrup (egad! ), wheat flour (why? ), salt: 480 mg per serving, or 1200 per prepared can. Why so much? (HOLY COW), vegetable oil (they don’t say what kind, so it is suspect), flavoring (very mysterious). It also contains 12 grams of sugar per serving (multiply by 2.5 for the whole prepared can). 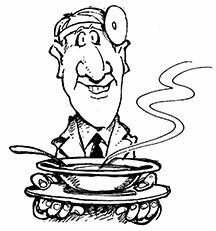 Snickers only has 30 grams of sugar, so a can of C’s tomato soup is almost as full of sugar as a candy bar. BTW, 1 teaspoon of sugar is 4 grams. That means that C puts 7.5 teaspoons of sugar into each can. So, here’s what I did. I made my own Tomato Soup. I canned mine with a pressure canner. If you don’t have one, you can jar it and freeze it. My recipe made 8 pints. No Boogers in the Wine. Table Manners in Medieval and Renaissance Times. GMO—Good, Bad, Ugly or Harmless and No Big Deal?